In World Diabetes Day 2018, the Pan American Health Organization / World Health Organization (PAHO/WHO) unites with partners around the world to highlight the impact of diabetes in families and the role of family members in supporting prevention, early diagnosis and correct management of diabetes. In addition to the economic impact on the countries’ health systems, the disease imposes additional charges on family budgets due to costs on medication, treatment, care, disabilities and premature death. Approximately 62 million people have type 2 diabetes in the Americas and need support by their families. Many people with type 2 diabetes remain undiagnosed. Support from the family is essential for understanding risk factors, signals and symptoms, as well as to search for emergency care in proper time when suspecting diabetes. Many cases could be prevented through public health policies and lifestyle changes that promote a healthy diet, physical activity and adequate body weight, which must be controlled in order to prevent complications. 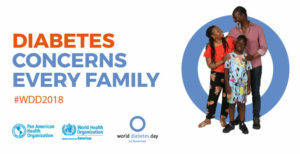 The theme of World Diabetes Day in 2018 and 2019 is “Family and Diabetes”. The biannual duration of the campaign, chosen by the International Diabetes Federation, aims to facilitate the planning, development and promotion of actions meant to raise awareness on the impact of diabetes on the family and on the patients’ support network and to promote the role of the family in the management, treatment, prevention and education on diabetes. The campaign provides information on a disease that grows continuously, with three out of four people with diabetes living in countries with low or medium income. Although 80% of cases of type 2 diabetes could be avoided through the adoption of a healthy lifestyle, 50% of the people carrying the disease remain undiagnosed. Moreover, diabetes is the main cause of coronary disease, strokes, blindness, kidney failure, and amputation of lower members. The number of people with the disease is currently 425 million people, and may reach 500 million people in 2030. Still, less than half of them have access to education programs about the disease. Diabetes and its complications are the seventh cause of death in the world. 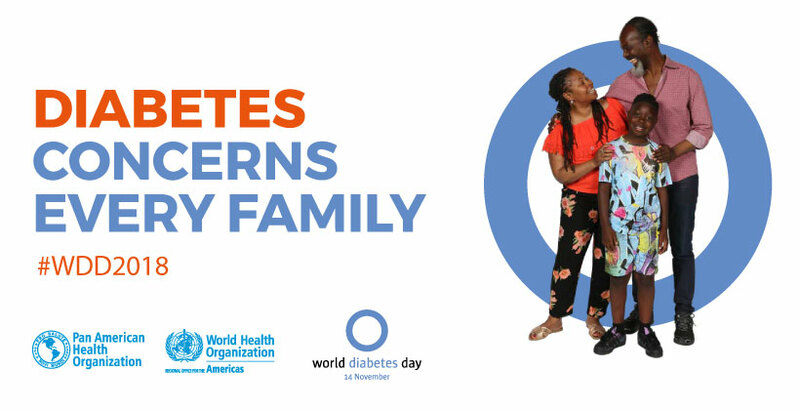 BIREME/PAHO/WHO enables access to documents and sources of scientific and technical information related to the themes of World Diabetes Day 2018 through the Virtual Health Library (VHL). BIREME supports locally developed intersectoral actions, which is the case of the Center’s presence in the event “MEXA-SE – Idéias e ações para sair da inatividade” (“Move yourself – Ideas and actions to get out of inactivity”), promoted by the Universidade Federal de São Paulo (UNIFESP) and by the Technical Health Units of the Municipality of São Paulo, Santo Amaro and Cidade Ademar, to present the Programs “Let’s be active: everyone, everywhere, everyday ACTIVE: a technical package for increasing physical activity” promoted by the WHO, cooperating with Agenda 2030 and the Sustainable Development Objectives to fight non-transmissible diseases, among which is diabetes. BIREME supports, stimulates and promotes the practice of physical activities and healthy lifestyles among its collaborators through awareness campaigns, lectures with health professionals, nutritionists and physical educators. The practice of work gymnastics, oriented by Prof. Sérgio H. F. de Carvalho, Auxiliary Coordinator of the Physical Education Course of Universidade Paulista (UNIP) and his team, which takes place twice a week within the premises of the Center, contributes to disseminate the benefits of an active life style that protects from non-communicable diseases such as diabetes, cardiovascular diseases and many others. World Diabetes Day is celebrated every day on November 14, through the initiative of the International Diabetes Federation. The date was created in 1990 by the Federation and the World Health Organization. In 2006, the date became official through the approval of the United Nations Resolution 61/225. The campaign’s objective is to promote the Federation’s efforts and coordinate globally the importance of joint actions to face diabetes as a global health issue. The campaign is represented by a blue circle, symbolizing the unity of the global community in response to the diabetes epidemic. Sources: World Health Organization, Pan American Health Organization, International Diabetes Federation.